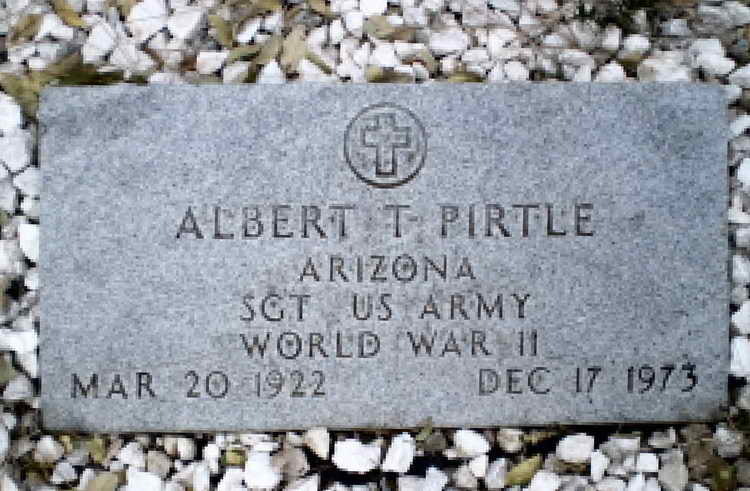 Grave marker for Albert T. Pirtle in Citizens Cemetery, Flagstaff (Coconino county), Arizona. Albert enlisted in the Army on 11 July 1940. His early service career is unknown including when he initially was assigned to the 508th. His name first appears on regimental records on 29 July 1943 when T/5 Pirtle was awarded a Good Conduct Medal. On 14 March 1944 he was transferred to detached duty with the newly formed Provisional Rigger Company in Cottesmore, England. He was a member of a pool of riggers from multiple 82nd Airborne Division units. T/5 Pirtle returned to duty with the Service Company on 29 June 1944. He was transferred to duty with Detachment #1, Service Company on 26 October 1944.. He was promoted to Sergeant on 6 November 1944. Sgt Pirtle's military decorations include the Bronze Service Arrowhead device awarded for participation in Normandy assault.